This is an extremely collectible vertebrate fossil. It is a super Fossil Soft-Shelled Turtle from the Cretaceous of China. This specimen was acquired from the Richard Busch Collection, who originally acquired it from the Chance Collection. Busch was the Preparator/Asst. Curator at the North Museum in Lancaster, PA from 1965-1992. This type of turtle lived among the dinosaurs in the Cretaceous Period, but survived the death of the dinosaurs, and the type is still alive today! This cool specimen was found in the famous fossil Bird layers in China, but in this formation, turtles are actually rarer than fossil birds! This specimen is extremely complete, with the skull and most of all four limbs intact! The large shell and distinct bones have great detail preserved. The shell especially has extremely nice form and articulation. The turtle displays beautifully on the semi-squared plate of shale. 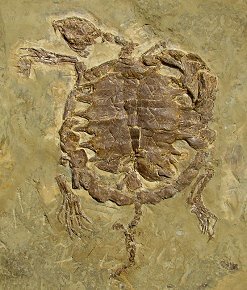 This is a very fine example of an ultra rare fossil soft-shelled turtle that has the skull and limbs well displayed (RARE). Another fine offering from the famous Busch Collection. NOTE: China has now banned the export of fossils. This fossil was acquired long before the ban was put into effect.